With over 800 miles worth of hiking trails in the Smoky Mountains National Park it’s hard to decide what trails are the best to try! We’ve narrowed down 8 trails in the Smokies that vary in difficulty, but all have rewarding views to see and peaceful walks to enjoy. The Rocky Top Trail to Thunderhead Mountain is not an easy hike but it is a beautiful and rewarding one! Once you hike this trail you’ll understand why the Osborne Brothers wished they were on ole Rocky Top! The hike is around 13 miles round trip, and gains over 3500 feet in elevation! Once you’ve hiked 5 miles and reached Spence Field you’ll go left for another mile and finally reach Rocky Top! From here you will be treated to stunning 360 views of Smokies! Many even call this view the best view in the Smoky Mountains! Mt. LeConte can be accessed by several trails, but getting to it via Rainbow Falls is a pretty way to go. The hike to Rainbow Falls is almost 3 miles and from there it’s another 4.2 to Mt. Leconte. Reaching Rainbow Falls is a sweet treat along the way to Leconte. The 80 ft waterfall is beautiful. The rest of the climb to LeConte is peaceful and quite and perfect if you are looking to enjoy that one on one time with nature. Once you reach Mt. LeConte you will be on the third highest peak in the Smoky Mountains and get to see some amazing mountain views! Charlies Bunion is one of the best hiking trails in the Smoky Mountains National Park. The hike is 8 miles round trip and takes you partially along the Appalachian Trail. During your trek up this trail you’ll be treated to views of the North Carolina Smokies and lots of wildflowers. Also along the trail is a campsite and shelter for campers and a natural spring for water. The end point of Charlies Bunion looks down a valley like area between Mt Kephart and Mt. Guyot and looks stunning any time of the year. Andrews Bald is a fantastic hike to bring your family on, even kids! The hike is only 3.5 miles round trip, and for two-thirds of the way there it is downhill! Once you reach Andrews Bald you’ll be rewarded with great views of the North Carolina Smokies. Because the hike isn’t long this is a great option if you would like to picnic in the park! The hike to Laurel Falls is a popular one in the national park. The trail is only 2.3 miles round trip and it’s even paved! Because it’s paved and has a slow ascent up the mountain to the waterfall it is one of the easiest hikes in the national park. Laurel Falls is a two-tiered waterfall. Thanks to a foot bridge you can actually pass from one side of the waterfall to the other. This is a great photo opportunity! The Porters Creek Trail is relatively flat and is 4 miles round trip. This is a great easy hike that takes you past several historic structures in the park. In the spring and early summer it’s also a great place to see wildflowers. Alum Cave is a popular trail in the national park. One way is about 3 miles, but along those three miles you’ll come across many different sights! You’ll follow along a river, cross up and through a cave, and get to see some mountain views along the way! Once you reach the Alum Cave Bluffs it’s a great place to have a snack and admire the large rock formation above you. The Gatlinburg Trail is 1.9 miles one way. It travels from the edge of Gatlinburg to Sugarland Visitor Center in the national park. This is a very peaceful and calm trail to walk along.. The trail is flat and follows a river that you will have the chance to cross over on a picturesque bridge. Along the trail you see beautiful woodlands, and even some local wildlife like chipmunks, turkeys, maybe even deer! When you come to the Smokies make sure you see them in the best ways! 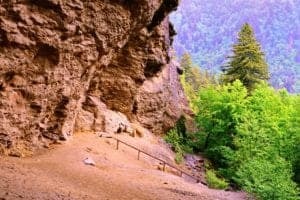 Go out there and explore these great hiking trails in the Smoky Mountains National Park that are sure to leave you in awe and ready to explore the next amazing trail!